Alvaro Castillo is one of three 2017 Alliance of Hispanic Serving Institution Educators (AHSIE) Seed to Tree Student Scholarship winners. Castillo wants to become a professor while pursuing his Masters of Arts in English at CSUN. Photo by Luis Garcia. 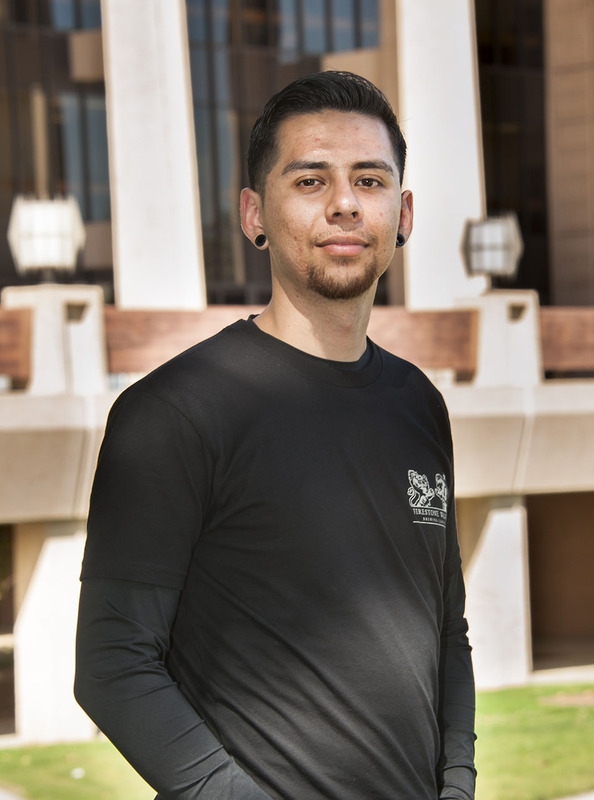 The Alliance of Hispanic Serving Institution Educators (AHSIE) has selected California State University, Northridge graduate student Alvaro Castillo as one of three winners nationwide of the alliance’s Seed to Tree Student Scholarship. The AHSIE scholarship highlights college students who have helped promote the retention and presence of underserved communities — particularly Latino communities — in higher education. Castillo, an undocumented student, learned about the opportunity to apply for the AHSIE scholarship while participating in a study-abroad program in Mexico, specifically in Mexico City and the state of Cuernavaca, in the winter of 2015-16. There he met professor Daniel Loera from the University of La Verne. Loera is the director of that university’s multicultural center and active in the AHSIE organization. “[In] one of our projects, as part of the study abroad program, we had to devise a way to become involved in the undocumented student circles,” said Castillo, one of approximately 1,400 undocumented students at CSUN. While at CSUN, Castillo has served as a writing tutor and supplemental instructor at the Learning Resource Center (LRC) and as a communications coordinator intern at CSUN’s expanded DREAM Center — a resource center for undocumented students located in the University Student Union. As a DREAM Center intern, Castillo worked to help students with questions ranging from class schedules to navigating campus bureaucracy. As a tutor and instructor at the LRC, he offered support to students struggling with things such as papers or essays revolving around immigration and underserved populations. The students often feel scared to speak and write honestly about topics that hit so close to home, he said. “I’m there to open that space up for students who feel connected to [those issues] — who want to become involved,” he said. “I met undocumented students who had never come out to anybody except me, and in doing so, I connected them with the DREAM Center. I feel like we’re painting a diagram. If my involvement in the DREAM Center is a big circle, my involvement in other sectors on campus feeds back to that. “I may not be the most vocal advocate, but if I see an opportunity where the DREAM Center could be involved or benefit [the students], I do my best to make sure that happens,” he continued. Castillo said that one responsibility of DREAM Center interns is to try to make their majors correlate with the work they do there. In his case, he wanted to see which English programs around the country were aware of the needs of undocumented students. When Castillo asked various programs whether they had services or opportunities for undocumented students, many responded that they had never been asked for such assistance. After completing his master’s at CSUN, Castillo said, he plans to pursue his Ph.D. in creative writing and literature, in hopes of one day becoming a professor. He has closely studied strategies that promote the retention of first-time, undocumented university students. AHSIE invited all three scholarship winners to its annual conference at the University of Nevada, Las Vegas, which was co-hosted by the Nevada System of Higher Education. Castillo and the other winners were honored during the conference’s welcome reception, and had the opportunity to speak to the more than 500 attendees about their experiences as students at an HSI. Each year, the conference brings educators and administrators from grant programs at HSIs around the country together to share best practices. For more information, visit the AHSIE web site.